So I am currently looking at installing some custom LED DRLs or LED strips similar to what the new Jaguar XF headlights have. I am trying to find a wiring diagram for the headlights or possibly tapping into one of the fuses relay boxes for the parking lights. I was wondering if anyone has done this already so I can get some input or if I will have to start from scratch for this setup. I am also contemplating many various options of placement for the lights. One option is to have them along the headlights similar to the new XF. Other option is to have them below following the curves of the chrome piece in the fog light area below the headlight. Only question is where I should run the wires to. I am trying to make it look as much as a factory setup as possible. Any ideas or suggestions would be greatly appreciated. Unless you spend crazy amount of money and have somebody integrate them into the lights, it's going to look cheap. I agree with Executive. 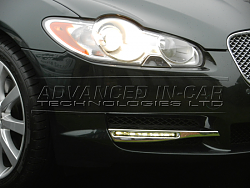 I know of a couple companies that do custom angel eye installations that are actually pretty high quality. If you were willing to go through the trouble to add LED strips (I have personally baked several sets of headlights in the oven and installed upgraded lenses, painted housings, etc. It's not hard but you definitely want to know what you are doing) you may just want to look into the angel eye route if they are made for those headlights. Those look OEM, but to plain for my liking. As a mechanic the labor aspect is the easiest part. I have the necessary tools to fabricate almost any shape I need to retrofit the DRLs into almost any location. If I plan on putting the LED lights in the headlights, I would buy an extra set of headlights take them apart, incorporate the LEDs to the interior rim of the headlights, add an extra projector shroud to the high beams, black out the rest of the interior pieces inside the headlight, tap into the front side lamps wires, and call it a day (maybe). I have all winter in my garage to get this work done, but right now I have a lot of state projects to complete before December relative to my Civil Engineering job. I am just doing some research and asking suggestions on ideas. I've been doing custom work like this for over 10 years so I can get very creative at solving almost any problem. The Jag realm is somewhat a new territory for custom work, but very interesting. Jaguar makes it hard to find diagnostic and wiring schematics for most of their newer cars since they want you to bring it in to the dealer for every work you do. I used to have online subscription to all manuals when I was still working for a performance shop down in Florida, but don't feel like paying $2500 for one now. I will be just putting my inventory of things I need together so once December comes I can start with both feet running. Either way I will keep everyone posted on my project! Nice! Sounds like you are the right person to tackle that project. If you like the look of carbon fiber, I would also look at potentially wrapping internal pieces of the headlight or installing carbon fiber inserts (you'd want to be conscious of the heat from the lights obviously). I have seen it done in several Acuras and it looks really really nice. Removing the orange inserts is also an easy job and gives the light a cleaner look. WRX ironically before I posted and read your message that's how I go about taking apart the headlights. I could drive to Chicago and have some company do the work for me but then why have this knowledge of working on cars only to be lazy and pay someone else who is most likely gouging you on labor cost and parts? I mean if you could change your own oil with better quality for close to the same price you pay for one at jiffy lube or whatever why wouldn't you? I understand life can get real busy with little to no time but honestly its convenience your paying for. I'm pretty sure all the knowledge I have of working on F/A 18 SH as a Jet Mechanic (AD) before converting to a Religious Program Specialist (RP) is still there. If the Navy trust me enough (I did good work also) to work on a 50 million dollar aircraft, I am pretty sure I can work on 45-60k car brand new lol! One tip if you haven't done a lot of them: Consider getting headlight sealer rope (best way I can describe it) from a car manufacturer. I know a friend who got some from Nissan. You can obviously use sealant from a tube which I have done several times but the stuff from the auto makers comes in like a rope form that seems to create a lot better seal. I had one headlight that broke a seal no matter how careful I was to reapply the silicone sealant. The paint I will be using will be able to resist heat temp up to 1000 degrees. I haven't really thought about carbon fiber since you want a high quality real CF wrap if your using that internally in the headlights otherwise could be considered a fire hazard. I will have to talk to one of my very good friends on getting me some CF since he is a graphic designer and owns his own shop. This project will definitely require some extensive research before I start to determine my options. Either way its going to be a fun and interesting project. Its called Butyl Sealant comes in a roll looks like a small rope. You can get from any auto parts store just make sure you use this and not epoxy as that can cause fumes and discolor the interior of the headlights if the interior of the light gets too hot. Would be nice to have another Jag owner in my area we could be coming up with different ideas and projects to do together. If I had another set of hands and another brain I could get a lot of custom work done lol. what's the recipe for baking the headlights? That is an interesting project WRX, without the wiring diagram for the car this process can be tedious due to testing various wires and fuse boxes to make sure you get adequate power. My buddy did a pretty sick radar detector mod to his car. He took the radar detector apart, his was a Valentine V1, made a cut out on his dash (not recommended for our cars)and fabricated a housing to hold it flush in his dash, tapped into his accessory fuse radio to be exact (I think there are pre-made wires for various detectors), ran the wires under his dash, and viola nice clean installed. I'm sure I have pictures somewhere once I unpack my house. If you need help with it shoot me a pm. Got two DRL led strips on the front. Nothing to do with how they look aesthetically or anything to do with that... I fitted them after I was sitting on the A69 waiting to pull out and looking west, there was a low sun and I thought I saw a space in the traffic big enough to pull out. So let us stop messing about and BS and someone let me know where in China or whatever you can get this kit. I mena I understand that many of your are expert mechanics but do you really know the cost of the parts to make the DRL ? Last edited by lotusespritse; 09-06-2014 at 09:45 AM. I'm normally not one to knock Chinese rip-offs, and I too am pretty shocked at the price of those DRL add-ons. BUT one exception I'll always make now for Chinese rip-offs is LEDs - they're just not worth using on cars. The cheaper LEDs they use don't cope well with the vibrations on a car, which is why if you see anyone with the cheap LED strips fitted to their car where they've been fitted for a long time you'll see one or two flickering and more than that not working any more! You even see the cheap LEDs sold on eBay now specifically with the feature of "no flicker", so the manufacturers must know it's a problem, but I'm reliably informed even the no-flicker ones still flicker and die after a period of time. Those DLR strips won't work on the XFR anyway......cheap or expensive! I know this is an old topic, but it might help others. I bought this lights that are on the silver chrome, the package includes 2 lights and the controller. The controller has 4 cables, red, yellow, black and white. I connected the red together with the yellow on the live empty fuse inside the engine fuse box, and I connected the black together with the white on the bolt which is just outside the fuse box. The DRL switches on when the ignition is on and when the engine is running, which is what I wanted. I wonder if this connection is correct, but all seems to be working well.